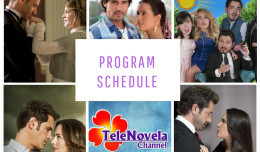 In the Name of Love: Episode 5 | TeleNovela Channel - Bringing you closer to lifes drama. Paloma escapes from home to join Romina and Emiliano for a reunion. During the reunion, Paloma meets Inaki. Impressed with Paloma’s beauty, Inaki invites Paloma for a cup of coffee. Much to Paloma’s surprise, Carlota shows up in the coffee-shop. On the other hand, Diana is very happy about Emiliano’s relationship with Romina which annoys Emiliano very much. He then asks his mother to stop trying to control his life. Cristobal, who is now a priest, transfers to another parish and crosses paths with Natalia and asks for her forgiveness.